Professional ID card maker utility is most suitable application for all major business application areas such as Shipping, Airlines, Telecom, Retails, Pharmaceuticals, Government Agencies and many others. Outstanding label creator utility is specially designed and developed to create valuable cards, labels for commercial purpose. Amazing card designing program creates colorful business cards that easily recognized by all card scanners, printers available in market. Brilliant ID card designer program effectively produces high quality business cards, coupons etc using wizards, with blank formats. Professional label designer software permits you to save all generated business cards, envelops, coupons in specified location on PC for future references. ID card maker program is used to create wide range of impressive labels of various color, font, style, design, shape, dimension, size, density etc. Download label developer program creates cards with the help of numerous graphical stuffs like line, pencil, triangle, rectangle, star, arc, circle, ellipse, picture, text and much more. Card maker software designs labels in different forms including Visiting cards, Business cards, Photo ID cards, Greeting cards, Badges, Envelops, Coupons, Logo and many more. Freeware label producer utility provides user-friendly GUI that helps novice users to access software without requiring any special technical skills. Excellent card designer software supports all latest editions of Windows OS including Windows XP, 7, Vista series etc. * Advance label designer tool creates colorful, stylish visiting cards, ribbons etc. 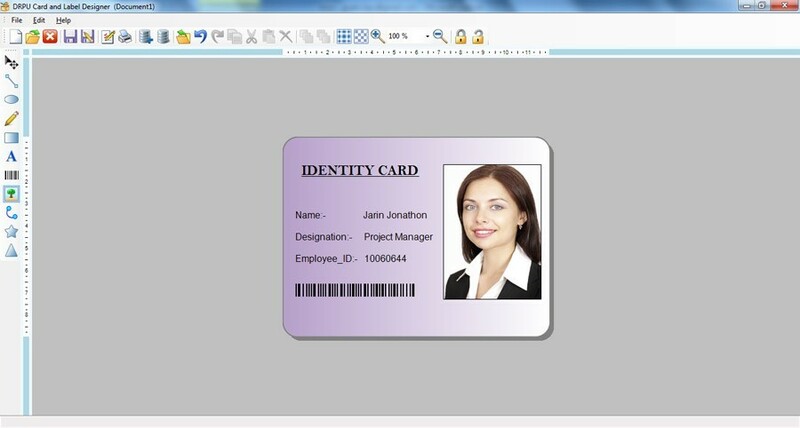 * ID card maker application generates striking, nice looking visiting cards, envelopes etc in just few seconds. * Card creator software develops business-specific cards and labels in an easiest way. * ID card maker program produces huge amount of attractive business cards, ribbons, coupons etc.